How cool is this cache! Johny Cache goes Western Hemisphere! Baarle - In the southern part of the Netherlands one can find a unique geographical oddity, unique at least in the Netherlands, but maybe even in the world. The town of Baarle-Nassau / Baarle-Hertog is part Dutch (the Nassau part), part Belgian (the Hertog part). It's not like you might think because the town is lying exactly on the Dutch-Belgian border, which it's not. Instead it's because the town, which is completely surrounded by Dutch territory, is partly made up of Belgian enclaves (the Belgian municipality of Baarle-Hertog contains a total of 22 enclaves, most of them directly in the village of Baarle or its vicinity, and a few of them in the rural areas of the Dutch Baarle-Nassau municipality surrounding the village). The enclaves do not cut the town nicely in half, but instead it seems as if they are randomly thrown out over the area by a giant. To make things even more complicated, within two of the larger Belgian enclaves lie a total of 7 Dutch sub-enclaves. On a stroll through the village of Baarle one therefore constantly crosses the border from the Netherlands to Belgium, or vice versa. In the town the borders are marked with special tiles or metal markers and can be found practically anywhere, and also in Google Earth it's just one big border spaghetti. The borders at many places even cut houses and other buildings in half. In theory it might be possible for a couple sharing the same bed to have one half of the couple sleeping in the Netherlands while the other sleeps in Belgium. Beside the Belgian enclaves the Dutch municipality of Baarle-Nassau also has one exclave just over the true border in Belgium. Are you still with me? The enclave situation dates back to the middle ages when the Dukes of Brabant and the Lords of Breda made all kinds of complex treaties, agreements, land-swaps and sales. All this geographical confusion will be yours to discover if you do geocache Grenzen Verleggen (GC1CK0Q). We needed both a Saturday and Sunday to complete this 55km long multi-cache. It brought us to places like the famous Baarle house where the border runs exactly through the front door. The house has two house numbers, a Belgian and a Dutch one. The cache itself lies close to Belgian enclave number 22. The smallest of all 22 enclaves until 1995 was no-man's land belonging to neither the Netherlands nor Belgium. The small square piece of land was used by radio pirates to broadcast from, as there were no regulations about broadcast licenses. Neutral Moresnet - Another geographical oddity, although not in existence anymore, but therefore not less intriguing, is Neutral Moresnet. Neutral Morsenet was a independent dwarf country at the three-country point in the southeastern part of the Netherlands where the borders of the Netherlands, Belgium and Germany meet. Last April I received a surprising e-mail from Alaskan geocacher Ladybug Kids. I met LBK (a.k.a. 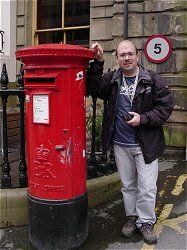 Mike) in 2004 through the Internet when he replied to a forum request I'd posted for an Alaskan geocacher to participate in a Dutch - Alaskan geocache exchange. LBK hid my Dutch geocache in Alaska, and in return I hid his Alaskan cache in the Netherlands. To this day, Dutch Treat (GCMXEK), the Dutch cache in Fairbanks, Alaska, is still alive, but it must have been a couple of years though since LBK and I had last contacted eachother. In his e-mail LBK explained that in April he would be in Europe for a business trip, and that he had the opportunity to spend a free weekend in the Netherlands and wanted to meet up. I looked forward to meeting LBK face to face, and I didn't have to think twice about offering to pick up LBK and his co worker Joe from Schiphol Airport to do some geocaching together that weekend, which was soon to be called "The Dutch Treat Weekend" in our e-mail back and forth planning our caching itinerary. 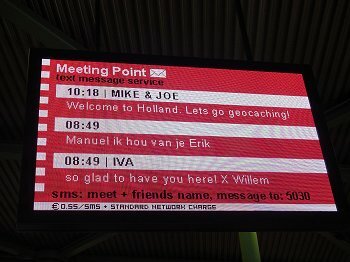 So on April 10 we met at the red and white cube at the meeting point at Schiphol. From the airport we drove directly to National Park Loonse and Drunense Duinen in the southern part of the Netherlands to do my cache Dutch Sahara (GC17B3) as well as some other caches in the direct vicinity. I believe I really impressed both Alaskans with the unexpected sight of a vast desert-like landscape in the Netherlands. While hiking to the cache we talked about the dangers of caching in Alaska, like the constant chance of encountering bears or agressive moose. Actually this doesn't seem to worry LBK and many other Alaskan geocachers much. They take their precautions not to surprise a bear, and make noise so bears hear them coming from afar and get the chance to get out of the area without confrontation. I think I wouldn't be very comfortable though being out geocaching in the Alaskan bush. Joe commented living below sea-level like many of us do in the Netherlands wouldn't be a comfortable thought either. Later that day, after having LBK and Joe checked in at the Stayokay Hostel in National Park Biesbosch we went for some more caches, this time in the historical part of my hometown Dordrecht. Around dinner time the cache DORDTSCHE GEVELS SPREKEN (GC1FPJ8) conveniently led us to the discovery of a poffertjes restaurant. LBK and Joe shortly before asked me about typical Dutch food, and poffertjes are typical Dutch, so we had dinner at the restaurant and enjoyed some "baby pancakes", as LBK likes to call poffertjes. The next day, after finding some more caches in Dordrecht, LBK and Joe took the high-speed Thalys train from Rotterdam to Paris for their business meeting. At the platform I waved goodbye to LBK, not knowing that soon we would meet again. We made plans to do some caches in the Ardennes, Belgium and neighbouring Monschau, Germany the next weekend, but unfortunately I got sick and our plans could not go through. We had much fun solving the puzzle for the Ardennes cache Gold Rush in Waimes (GC1J1GR). It's on top of our to-do list, might we ever get the chance again to do some caching together. I’m always keen on visiting new countries, and on adding a new country to my list of geocaches found. Who doesn’t like seeing a new country having turned red after updating his/her statistics with the Find Stats Generator macro in GSAK? Poland was one of the candidates to be added next to my list of visited countries. It was in the spring or so that I was reading the book "Het andere Duitsland" (The different Germany) by Jeroen Kuiper, and through which I learned about the island of Usedom in the northeasternmost part of Germany. The Baltic Sea island of Usedom is part German and part Polish (where the island is called Uznam). Since Poland entered the "borderless" Schengen Zone, the fences and border posts between Germany and Poland have been taken down and dismantled, and nowadays one can freely cross the border. In Kuiper’s book I read that on Usedom one can walk from Germany to Poland simply along the beach. This is where the mind of a geocacher hungering for new countries starts wandering off from the content of the book; this seemed like an easy and great way to find some Polish caches while operating from a base in Germany. A quick glance at Google Earth learned there were several caches close to the border on the Polish part of the island, most of them part of a series called "Caching ohne Grenze / bez granic". The opening up of the border wasn’t welcomed by all. The Germans were afraid criminality would rise, but the Poles had a completely different kind of frustration. FKK (Frei Körper Kultur), or nudism, had long been part of East German culture. When the border opened up, the Poles were not amused with the sight of all these naked people on the beach. The media were eager to report on the affair, both in Germany and abroad; a British newspaper headlined: "Poles and Germans go to war again - and this time they're naked". I would have headlined it with "- this time throwing bathing suits at eachother". I hoped one day I would be able to visit this intriguing part of Europe. This summer during my summer vacation, more or less in a spur of the moment, we decided to head the cache mobile to northeasternmost Germany to spend a couple of days caching on Usedom, our main goal of course finding a cache in Poland. But, as we found out, there’s much more the beautiful island has to offer, including lots of natural beauty, wonderful beaches, picturesque seaside towns with historical piers, and last but not least caches everywhere! The first day on Usedom we parked the car on the parking lot at the border in Germany. Across the road from the parking lot is a nice café with a neon sign saying: "Die letzte Deutsche Gaststätte vor Moskau" (The last German café before Moscow). It’s here where we found our first cache on Usedom, and the first one of the "bez granic"-series. From the café we continued on foot to the border and crossed over to Poland. Just over the border we directly headed northeast towards the beach over a sandy stripe of no mans land bordered on both sides by a dark forest. This is where we walked exactly along the border. 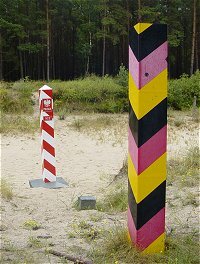 The old concrete fence posts are still there, as well as beautiful colorful German and Polish border poles. I’m a real geography buff, and things like this really make me drool. The borderline which we walked on also is the Oder-Neisse line, the border between Germany and Poland drawn after World War II. All pre-war German territory east of this line was awarded to either Poland or Russia. The Oregon 450 then lead us into the forest, and it wouldn’t be long before I was holding our first Polish cache in my hands. Mission completed! We returned to the border via the edge of the town of Swinoujscie. We walked by some busy markets where all kinds of stuff was sold, from garden dwarfs to cigarettes, but also honey, fruit, and vegetables, the fruit looking better, fresher and tastier than I’ve ever seen in the Netherlands. The streets and markets were bustling, and everywhere horse carriages could be seen, the popular local taxi cabs, looking more like big go-karts than carriages, transporting visitors from the border to Swinoujscie. On this trip there was even more for this geography buff to get excited about, and another personal geocaching milestone of some sort; it was our first visit of the German "Bundesländ" (federal state) of Mecklenburg-Vorpommern, and this was the 13th (out of 16) Bundesländ to find a cache in. The last three federal states still missing on our Geocaches found map of Germany are Saarland, Brandenburg and Hamburg (in blue on the map below). 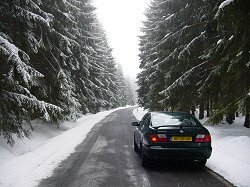 The Poland Express - A great story (in Dutch) about a group of Dutch geocachers caching in a wintery Poland. I read this story already in 2005, and ever since I had caching in Poland on my mind. 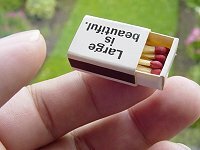 A couple of years ago geocaching.com decided to discontinue the ability to post virtual caches. So called "Waymarks" were introduced instead, with their own dedicated website at www.waymarking.com to post them and to log your visits. Now, I haven't been very active in "waymarking", but for one category I've made an exception: Penny Smashers. 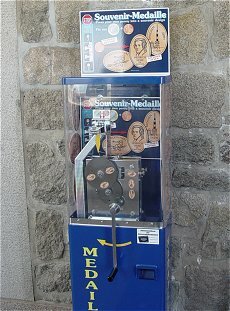 You've probably seen them, those machines with a crank handle that turn your pennies into elongated coins embossed with a new design mostly depicting a local (touristic) sight of interest or something else specific to the locality. These elongated pennies are a great way to collect souvenirs from your travels, and I've always been fascinated by these machines. I never pass one without cranking the handle to turn one of my pennies into a wonderful souvenir. Especially on our travels in Germany we regularly encounter a "penny smasher", and since I've discovered the Penny Smasher category on www.waymarking.com, I started posting the machines as waymarks. I like documenting the locations of the penny smashers this way with their geographical coordinates, as well as the designs they produce. I also like consulting the list of penny smashers posted by others, to see if there are any at my next travel destination. You can find the Penny Smasher category at waymarking.com here. Wikipedia has some information here. A good site dedicated to elongated pennies is www.pennycollector.com. It hosts a list of penny smashers all over the world, but without geographical coordinates; that's what we have www.waymarking.com for. Do you recognize this: everything is going the way you want to, you're free from work, you're in the outdoors caching, the weather is perfect, it's not too warm, it's not too cold, your breathing is calm and peaceful, you're feeling healthy and full of energy, your worries have disappeared, and it feels like you're having all the time in the world... You're having one of those rare perfect days, and although probably not entirely the same, you're in a state of mind resembling what in psychology is called flow. Such perfect days are rare indeed, in a year I probably have no more than five, and it seems they're getting less and less as you get older. It can happen any time, while driving on a quiet highway, or while painting your house, but to me it's mostly while I'm geocaching. I had such a day while doing the cache Der Wald hat viele Gesichter (GCKXAK) in the woods near a place called Bingen in Germany. What made this day so extra special, and what caused me to experience such a rare perfect day, I can't explain exactly. But I know that it was partly because this cache was simply perfect, set out in a very beautiful, perfect place. Der Wald hat viele Gesichter is a multi cache that takes you on a hike through a gorge in the woods that is affectionally called Steckeschlääferklamm. This translates to something like "stick dragging gorge". It's called this way because since old often the sounds can be heard echoing through the gorge of local hikers shortly dragging the points of their hiking sticks over the stony trail. Everybody using hiking sticks knows what this sounds like. That day the weather was quiet, there was no wind, and it must have been close to freezing point. This place felt so peaceful, there were almost no sounds, except for the continuous babbling of the small brook that runs and cascades through the gorge. The air was filled with fresh, crisp air, clearing your head in an instant. It felt as if my heart started beating in the rhythm of the surrounding nature. The gorge is filled with beautiful old, moss-covered trees. Many years ago a local woodcarver started carving faces in the trees of the Steckeschlääferklamm. Other local carvers have kept this tradition alive, and everywhere you go in the gorge the eyes of all sorts of carved out faces are looking at you. 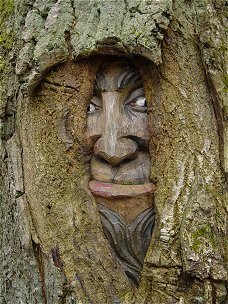 Many of the faces have been partly overgrown with new bark, and often just a small portion of the face is left with just one eye peeking through the opening in the bark. The forest might have already been, but all these carved out faces even made it more enchanting, magical, and mysterious! It's like walking around in a fairy-tale forest!! You wish such days could last forever, and you decide to hold on to this state of mind you're in forever, but you're not in control over it, and the next day it's gone. In the logbook someone wrote "This place is magical". I bet this simple but all-saying sentence expressed this man or woman's having such a rare perfect day as well. This place simply is magical! 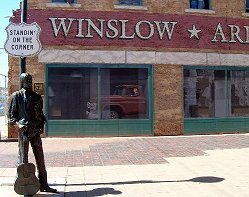 "I'm standing on a corner in Winslow, Arizona, such a fine sight to see, it's a girl my lord in a flatbed Ford, slowin' down to take a look at me". Who doesn't know this part to the lyrics of the famous Eagles song Take it Easy? I do very well, as people who know me know I'm a HUGE fan of the Eagles; how excited I was when they reunited in 1994, enabling me to actually go see them live in concert for the first time! How many times their music mustn't have accompanied us on a caching trip. And guess what, there's a virtual cache on Historic Route 66 at a corner in Winslow, Arizona! It's called Standin on a corner (GC64F7). There's a guy with a guitar standing there, and there's even a flatbed Ford! How cool is that? If I ever overcome my fear of flying, this cache will be on top of my to-do list! Last summer I bought a new cachemobile. Unfortunately its first owner obviously was not a music lover, as there is no cd player included in the stock audio installation of the car. Since the dashboard only allows a stock cd player to be built in, which is quite expensive, I decided to buy an iPod mp3-player instead to connect to the car's audiosystem. I could get an iPod Nano 8GB 3G at a bargain price because the 3G model had just been replaced by the new Nano 4G. While browsing iTunes I discovered there were lots of podcasts available dedicated to our hobby of geocaching. A podcast is a pre-recorded radio or television show made available to the general public as a downloadble media file. I'd known about podcasts for a long time, but never really payed much attention to them. Now I downloaded a couple of them to listen to on my iPod. I was pleasantly surprised, especially by a weekly show called Podcacher by Sonny and Sandy of San Diego, California. It's quite a professional show, and always a pleasure to listen to with lots of information and great geocaching stories from around the world. Our travel bug Cheechako was featured on Podcacher number 255 of February 7th, 2010. Another show I like to listen to is coming from my favorite caching country of Germany and is called Dosenfischer. This show is in German and has a more casual approach. It's a bit like having a couple of caching buddies over to chat about geocaching. Another favorite podcast of mine is a video podcast called Icenrye's Geocaching Videozine by Sheldon Pineo of BC, Canada. I already used to watch this show on the computer, but it's nice to be able to watch it on my iPod now whenever and wherever I feel like it. 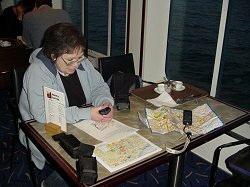 To the other passengers of the m/s Princess of Norway it might have gone unnoticed, but not to this geocacher and geography buff; in the morning of April 29th, 2008 on its 15-hour voyage from IJmuiden, Holland to Newcastle, England, the ship crossed the Greenwich Meridian (the prime meridian at 0 degrees longitude) and sailed into the Western Hemisphere! A first for Team JC! We were aboard the DFDS Seaways cruise-ferry Princess of Norway for a three-day "mini-cruise" to Newcastle, and were planning on discovering this Northeastern England town on the River Tyne by caching our way round. Beside being our first geocaching adventure on the Western Hemisphere, it was also the first time we were in the UK and the first time to find a cache there! It's country number 14 on our list of caches found. 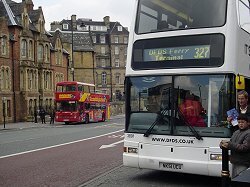 We arrived in the Port of Tyne around 9 in the morning (English time), and not much later a double decker bus, which drove left and had its driver on the right, dropped us off at the Central Station in the center of Newcastle. We had until 16:15 to spend the day as we pleased. For most of the other passengers on this mini-cruise that meant shopping and sightseeing, but for us it meant, if not mentioned earlier you might have guessed it, yes, GEOCACHING! We found a total of six caches; one small container and five micros. 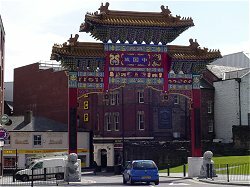 The caches lead us to the site of the castle that gave the town its name (GCW9B6), to the stadium of Premier League football team Newcastle United (GCYJ6Y), to the statue of Earl Grey (yes, the fellow that gave the famous tea blend its name - GCXWH4) , to a vampire rabbit (GCXTMK), to a dark, greasy and smelly alley behind the restaurants of Newcastle's Chinatown (you might want to skip this one if you don't want to forever loose your appetite for Chinese food! - GCQK82 :-) and to the remains of the medieval townwall (GCQK82). Around 18:00 hours we were back aboard the ship, and after a loud blow on the horn it sailed down the River Tyne past the North Shields Fish Quay and the ruins of the Tynemouth Priory back towards the open North Sea and IJmuiden. The winds had picked up and the sailing wasn't going to be as smooth as on the voyage west, but luckily nothing serious enough to make us seasick. 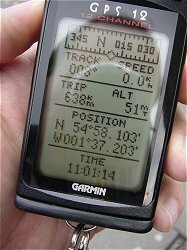 It had been a fun-packed day full of new impressions, sounds, sights and smells, and a couple of firsts in geocaching for us, with on our Garmin GPS12 and Etrex Legend a "W" in front of the longitude coordinate instead of the usual "E"! And if not for geocaching in Newcastle, the voyage with the Princess of Norway alone was a beautiful maritime experience we wouldn't have wanted to miss. 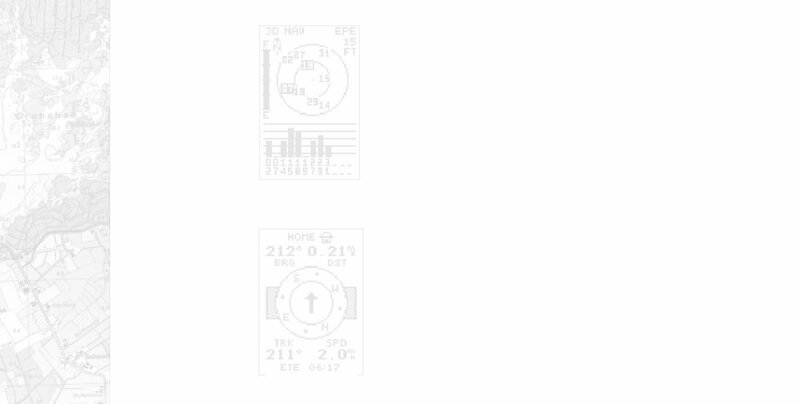 Hold mouse pointer over photos for caption. More photos in the "Caches Found" section. 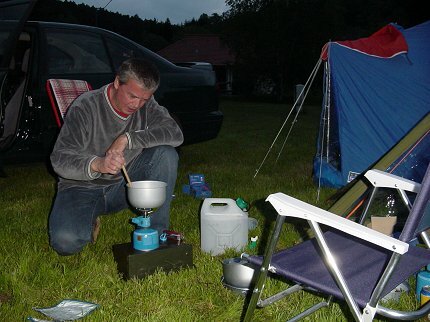 In the summer of 2007 we made a short geocaching trip to Berlin and Thuringia in Eastern Germany. We stayed in a cosy "Gasthof" for a couple of days in a little village called Schwarzmühle, deep in the Thuringian Forest. From here we did some caches in the area combined with a guided gold panning excursion to the river Katze. After a short explanation how to pan gold we got to pan our own gold at a spot in the river where in 2004 a 2 centimeter, 9.64 grams nugget was found. And, yes, we did find gold, just a couple of barely visible flakes and nuggets, but what a wonderful experience when all the pebbles and sand have been washed out of your pan and that little golden speck remains glittering in the sunshine! Gold fever!! I can tell you, gold panning is fun and, much like geocaching, makes you forget all your troubles! The highlight of our visit to the fascinating city of Berlin was visiting Checkpoint Charlie, the famous former allied border post between East and West Berlin during the Cold War. 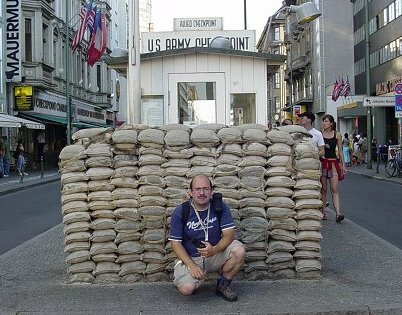 Checkpoint Charlie is also virtual cache Historic Words (GC9A6E). If you're ever there, don't forget to visit the Mauermuseum. Take your time because at this beautiful museum there's lots to see. Fascinating to see all those different and very creative ways people came up with to flee from East to West Germany! While visiting some of the christmas markets in Germany last year, I fell in love with the so called Erzgebirgische Volkskunst, traditional wooden folk art from the Erzgebirge region consisting of seasonal figures and pieces like smoking men, nutcrackers, angels and miners, candle pyramids and candle arches made in the typical Erzgebirge folk art style. In Germany, Erzgebirgische Volkskunst pieces are a popular Christmas-time ornament, and usually are for sale at many of the christmas market booths. Where is this Erzgebirge region, I hear you ask? That was exactly my question too. I soon discovered it's a region in the eastern part of the former German Democratic Republic (DDR) bordering on the Czech Republic. The people of the Erzgebirge used to make their living underground in the many ore mines of the area. To supplement their income, and later when ore supplies were dwindling and mines were closed, many of the miners started making wooden handicraft at home with their families to sell it and earn their daily living. 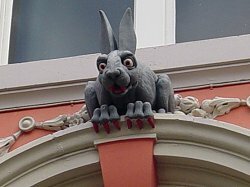 If the Erzgebirge is as charming as its folk art, I really must visit the region someday I told myself. While reading about the Erzgebirge on the Web, I also discovered another region in the former DDR that seemed worth a visit, it's called Sächsische Schweiz and lies just north of the Erzgebirge. 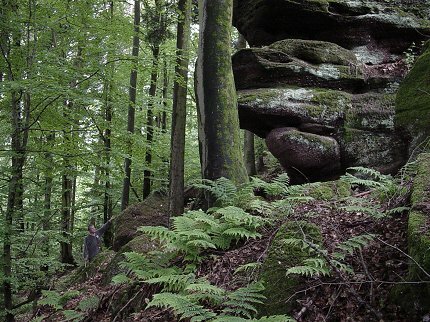 I saw pictures of the most wonderful sandstone formations, a landscape unlike any other in Europe. A view on the German map of www.cache-atlas.de (my favorite site for planning geocaching trips to Germany) showed many interesting caches in the area. Plans to visit both the Erzgebirge and Sächsische Schweiz began to take form. Finally last May we found ourselves on our way to East-Germany for a week of geocaching in the Erzgebirge and Sächsische Schweiz! 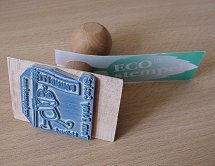 In July 2006 we had our own rubber stamp made. The stamp shows Signal the Frog with a "Found it!" flag, and holds the text "Team Johny Cache" and "Holland", as well as the URL of geocaching.com. The design was made by JC the old-fashioned way with a pencil and a black marker on a piece of A4 paper. It was then scanned at 600dpi for final retouching in Paint Shop. The actual rubber stamp was made by an online rubber stamp shop. 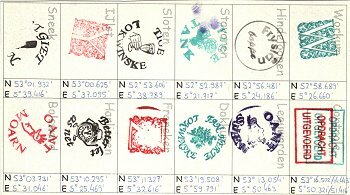 The stamp will be used with our logs in cache logbooks. 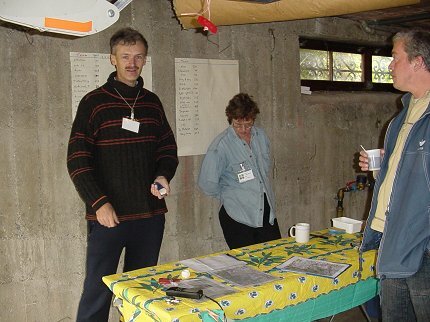 The first logbook to receive a Team Johny Cache stamp was the one of View over Goeree (GCW78H) on July 8th, 2006. 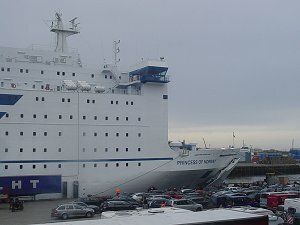 In the spring of 2005, while making a geocaching day trip to the island of Borkum with a ferry of the German shipping company A.G. Ems, I discovered that the coming summer this same company would have a twice-weekly service to the tiny and remote island of Helgoland with a fast, jet-propulsed catamaran departing from the Dutch harbour of Eemshaven. This allowed me to make a dream come true: setting foot and finding a cache on the island of Helgoland! Helgoland is a German island located in a part of the Northsea called Deutsche Bucht. The island, located about 70 km from the nearest German coastline, has an unusual history, the past two centuries having been Danish, British, and German. And being made up of sandstone cliffs here in the Northsea quite a geological oddity too. When browsing through my Times Atlas of the World, that tiny speck (the main island is just 1 square kilometer in size) on page 62 had always fascinated me. And after reading about Helgoland in the first part of the Island-series books of Dutch writer and island-expert Boudewijn Büch, my fascination had grown even stronger. So, on July 6th, 2005 we found ourselves on the catamaran Polarstern, cleaving the waves of a rough and dark-grey Northsea at an average speed of 60 km/h. The voyage would take approximately 3 hours, with a short stopover at the island of Borkum. The weather was bad but the closer we came to Helgoland the better it became. Eventually, through the drops of sea water that were constantly sprayed against the catamaran's windows, we saw the island turn up on the horizon, like a mirage beneath a blue and sunny sky. Setting foot on Helgoland felt surreal, I couldn't believe that I was actually standing there, on this island that seemed so remote to me! Both the island and its settlement are devided in an "Unterland" and an "Oberland" part. An elevator, or alternatively a couple of long stairs, brings you to the "Oberland" part of the island. This is where we started our hike to the virtual cache called Top of Pinneberg (GCG9CQ) which lies on the highest point of the island 61.3 meters above sea level. The first thing that struck me when we followed the trail on the Oberland was how lovely the island looked, and the special smell that accompanied this, a combination of smells from the butterfly occupied fields of flowers and the salty sea breeze. We followed the Klippenrandweg along the top of the red sandstone cliffs of the island. The cliffs are home to many seabirds, like for example the beautiful gannet (Sula bassana) of which several colonies could be observed from the Klippenrandweg very well, including their youngs! In the distance lies the small and flat island Düne, consisting mainly of sand and being just big enough to host the small Helgoland airstrip (in fact Helgoland is an archipelago consisting of the main island and Düne). The sea wasn't dark-grey anymore, but instead had turned into dark-blue with the sun glistening in its ripples. Except for Düne and a couple of boats, the horizon and the sea around us was completely empty. After a voyage of three hours we now found ourselves in a completely different world. The virtual cache was quickly located. It consists of a cross marking the highest point of the island (and of Pinneberg district to which Helgoland belongs) with a metal box containing a book in which visitors can write their names. 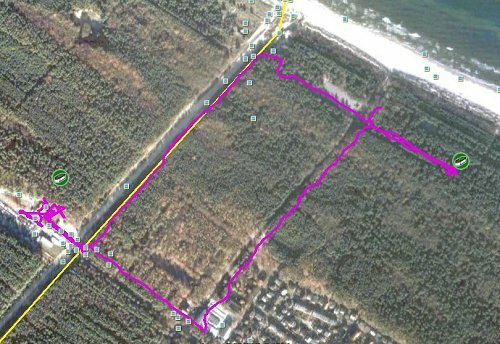 At the time there was one physical cache on the island but this one had a difficult terrain rating, so we opted to do only the virtual. The Top of Pinneberg virtual is the perfect cache for a cacher who only has a limited amount of time, and who besides caching also wants to do some sightseeing. When visiting the island with the Polarstern you'll have only a couple of hours before the catamaran returns to Eemshaven. 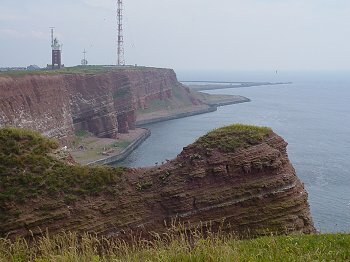 After finding the cache we continued following the Klippenrandweg for a bit to the viewing point from where one has a great view on Lange Anna, a 47 meters high free standing column of red sandstone, Helgoland's most famous landmark. After a stroll through the colorful settlement (carfree, and because of the island enjoying a tax-exempt status, popular with German visitors looking for cheap cigarettes, booze, and perfumes) we headed for the harbor again, boarded the Polarstern, and said goodbye to a remarkable island and a wonderful day of "island-caching". I can't remember what triggered it, it might have been the urge for something different, like the Slavic language, or it might have been my quest for adding new countries to my list of caches found, but for some reason I decided that this summer I wanted to visit the Czech Republic and Slovenia and do some geocaching there. It was especially Slovenia (not to be mistaken with Slovakia, Czechia's neighbour) that I wanted to visit, a fairly new country south of Austria formed in 1991 when it gained independence from the Socialist Federal Republic of Yugoslavia. When my plans began to take shape I regularly browsed through www.slovenia-tourism.si and various Slovenia travel guides at the bookstore, and awed at the pictures of majestic mountains, green and blue colored crystal clear rivers and lakes, and rustic villages with intriguing Slavic names like Kransjka Gora and Mojstrana. I couldn't wait to visit the country! I figured both Slovenia and the Czech Republic should be in daytrip distance from southeasternmost Germany. So, I booked a week in a vacation home in Unterwössen in Bavaria, situated centrally to make daytrips (very long daytrips!) possible to both Slovenia and the Czech Republic, and close to the border of Austria and thus ideal to do some caching in Austria as well. For Slovenia my choice fell on a couple of caches in the Triglav National Park in the Julian Alps, home to Slovenia's highest mountain, Mount Triglav (2864 meters). It turned out we only had time for one cache, Triglav National Park / Izviru Soce (GC1C7E), but what a beautiful one it was, not in the last place for the unsurpassed scenery of the area. After a long drive through Austria we finally arrived in Slovenia, and some exciting (the excitement of being in a country you've never been before, and of trying to read road signs in an incomprehensible language) kilometers later in the village of Kransjka Gora, port to Triglav National Park. We first took a stroll through this charming village known for the Slovenian fairy tale hero Kecek (of which there is a nice wooden statue in the center of the village), and of course did some souvenir hunting. 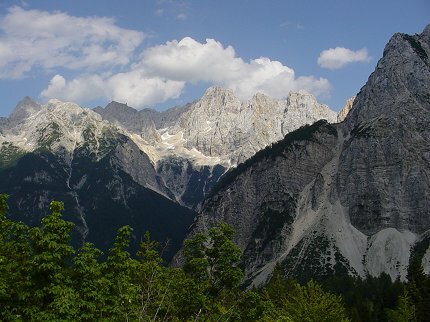 Then off we went into the mountains of the Julian Alps. The 1611 meter high Vrsic Pass was reached after countless hairpin curves and no less incredible mountain vistas, and to get to the trail head of the Triglav National Park / Izviru Soce cache had to be descended again in at least as much hairpin curves as encountered on the ascent. On the ascent we passed the beautiful Russian chapel built in 1917 by Russian prisonors of war who built the road over the Vrsic Pass. The beautiful chapel is definitely worth a stop. 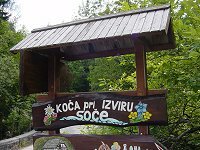 The Triglav National Park / Izviru Soce cache is located on a trail leading to the source of the Soca River. At the trail head there is a very nice mountain lodge, ideal to take a rest and refresh yourself after the hike. After hitting the trail, the cache was reached surprisingly quick, which I must say was allright with us as we hadn't that much time. It was a hot day with clear blue skies and back at the trail head in the shadow of the mountain lodge we ate a very good tasting icecream and enjoyed the moment of being in Slovenia and having found our first Slovenian cache! Then we started on the long drive back to Germany. We had too little time and I hope to be able to return someday and explore more of this very beautiful country. More caches are waiting to be found, too! Nasvidenje, Slovenia! The following days we did some touring and geocaching in Austria. The Schmuggler Cache (GCH3KF), just over the border in Austria and not far from Unterwössen, was a real beauty. 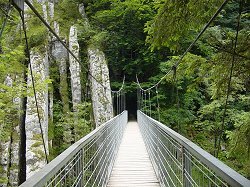 It's located in a spectacular gorge with a wild river popular with local kayakers and rafters, a cool suspension bridge (aren't these the coolest things!) and a nice river pebble beach. A short trail leads you down along the beautiful Maria Klobenstein chapel to the bottom of the gorge. Legend has it that at this spot a woman was about to get crushed by a huge boulder tumbling down from the mountains. The woman started praying to Holy Mary, and as a miracle the boulder split in two just before hitting the woman who as a result was left unharmed! Later on this spot a chapel was built. This charming little chapel was appropriately called Maria Klobenstein, and is indeed partly built against a cleaved boulder. A very special place. It again was a very hot day and after finding a cache what's nicer than to cool down in a wild river and to chill on a river pebble beach! The Mozartkugel (GCM6AF) cache in the town of Salzburg was an absolute highlight! This is the most beautiful town I've ever seen! Well known for the Von Trapp's and their Sound of Music story and of course for being the town of composer Wolfgang Amadeus Mozart, and last but not least for the chocolate delicacy called Mozartkugel. The Mozartkugel cache was a real tough one because of bad satellite reception, but it gives you an excellent tour through town and shows you many of its most beautiful and interesting places, including the home and birthplace of Mozart. During the final leg of this multi-cache we started feeling the pressure of time as we had to catch the last train back to Germany (I don't like driving - and trying to find a parking place - in big cities, so we had decided to take the Deutsche Bahn). Luckily we had found a very convenient and time saving way to get to the top of the Mönchsberg where the cache is located: an elevator going straight through the mountain up to the top! 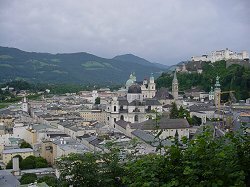 Great view on Salzburg from up there! From here the town almost had something oriental! Also at the cache site the GPSr arrow couldn't make up its mind, and in between the search we had to wait out a severe thunderstorm in the restaurant on top of the mountain. On our second try, in the nick of time, we finally managed to find the plastic box, the crown of an already magnificent day! On July 1st, with finding the Kvilda View (GCK069) cache in the Czech Republic, I added the 12th country to my list of geocaches found. We had come via the border post at Bayerisch Eisenstein. When we had just entered the Czech Republic the first thing we noticed were the dozens of Asian markets, selling all kinds of stuff, from giant garden dwarfs and Christmas ornaments to booze and cigarettes. The Asian people trying with their best effort to wave and lure you into stopping and buying something from them. Quite an unusual sight, and one might think he has entered Bangkok, Thailand rather than a country of the former Eastern bloc. Beside Asian markets we also encountered nearly as many night clubs. A couple of kilometers after the town of Zelezna Ruda, which was quite busy with Germans looking for cheap booze, cigarettes, fuel, and who knows what else, we took a turn right and had entered the tranquil and sparcely populated area of Sumava. Sumava is part of the Bohemian Forest and is a largely forested area with streams, marshes and peatbogs. For over 40 years the area was part of the Iron Curtain and massive tourist development did not take place, leaving nature practically unspoiled. Very few other cars were seen on the road to Kvilda, and only a few times we came through a little settlement or a little village. Differences in wealth were very clear in this country; some drove a new Volkswagen Passat, others still drove their at least 20 years old Czech made Skoda car. I like to believe we visited Czechia the way it used to be, and I think things are about to change big and quick in this country, for sure! Without doubt much already has. The Kvilda View cache is hidden in the hills overlooking the village of Kvilda, a little village of which I found the beautiful wooden church the most prominent sight. The cache was easily reached and quickly found. 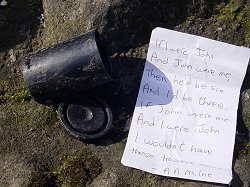 More photos in the "Caches Found" section. Hold mouse pointer over photos for caption, click for larger version. Early this year on various European forums announcements started to appear for an upcoming geocaching event to be held in the Alsace region of France. The announcements immediately caught my attention as they were posted by sTeamTraen, a multi-lingual (including Dutch) Englishman living near Strasbourg, France, and passionate geocacher who I had the pleasure of meeting at a cache called Linaigrette (GCA10B) when I was in France last year (see "Travel Bugs"). sTeamTraen, also known under his real name Nick, had taken up the plan to stage a one-day geocaching event for May 15th called AlsaCache 2005 (GCMDAP), not only the first-ever cache event in Alsace, but also in the whole of France! 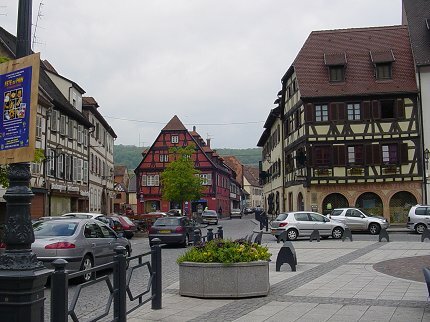 I knew the beautiful Alsace region alone would be worth the trip, and when uncle and geocaching buddy EEG seemed to be interested too, serious plans started to form to attend the event in combination with a 4-day-weekend camp-out in the area. Soon a "will attend" was posted to the event page on gc.com. Two days before the event, on Friday May 13th (! ), after a 600 kilometer drive, we arrived at Camping Les Huttes in Wangenbourg, located in the mountains about a half hour drive from event location Traenheim. High season was still a couple of months away, and once pitched our two small tents were the only ones there. The camp site was shared with only a few Frenchmen in camping trailers and one fellow countryman with a luxury RV. The latter had decided to seek the shelter of Les Huttes that night because Radio Nederland Wereldomroep had forecasted heavy weather for north eastern France, as the guy came frantically telling us. Luckily all stayed relatively quiet that night, except for the little murmuring brook behind our tents, the couple of dozen owls in the forest (providing for a high Blair Witch Project feeling), the churchbells of Wangenbourg which were loudly rang every half hour throughout the night (at one point giving me visions of a hump-backed bell-ringer of Wangenbourg), the snoring of EEG in the tent next to me, and later raindrops falling on the canvas. The next day we set out to do some geocaching and sightseeing. 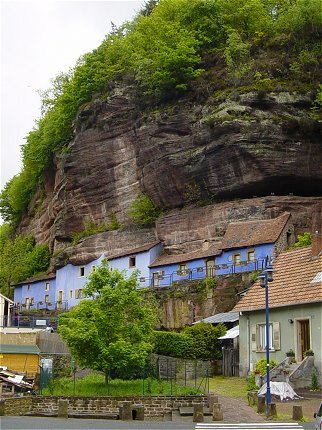 We first visited the rock houses (Les maisons troglodytes) in Graufthal, and bought baguettes and some bottles of fine local wine in Saverne. The rock houses were wonderful, and we tipped the site to sTeamTraen as being a great location for a cache. We would have placed one ourselves if we had been able to maintain it. We then chose to do the cache Tres Tabernae (GCM79M) because it was closest to Saverne. Cache density isn't very high in Alsace, and almost all caches in the area are owned by sTeamTraen, the AlsaCache event organizer, and Tres Tabernae is no exception. We had much problems finding the cache on the very steep terrain, and finally EEG decided to call Nick for a hint, much to my dismay because I rather go on searching for a couple of hours than call for a hint. With Nick's help the cache was quickly found at a spot which we had already looked at earlier, but obviously not good enough. And with this pouring rain I had soon forgiven EEG for having called the cache owner. That night, tired of the scramble to Tres Tabernae, and after having put our CampingGaz cooking burners to good work for a couple of cups of steaming coffee, hot chocolate, and some burgers, we hit the sack early and were soon vast asleep. Tomorrow we'd have to wake early for the event starting at 08:30 hours. In the meantime a German couple with a vintage VW Beetle and a small tent had joined us at the camp site. The next morning shortly before 8 the first cellphone SMS message was received from the event organization: Bienvenue à / Welcome to / Willkommen bei / Welkom bij AlsaCache 2005! Molsheim 67310 Traenheim N48º35.590 E007º28.040 @08:30 (More SMS messages would follow later that day for those who were participating in the "race" of the event which also contained an optional competetive element). Luckily our tents had withstand last night's very strong winds. It seemed the heavy weather that was forecasted for the night of our arrival had decided to arrive 24 hours later. Not really interested in the competitive element of the event we arrived in Traenheim an hour after starting time. We were welcomed by Nick and his wife. The garage of their home was turned into a professional looking HQ with still blank points tables hanging on one of the walls. Nick immediately tried to get us in a competitive spirit by mentioning that all the Germans had a one hour head start on us, and that the Belgians were determined to beat the Germans. That's when we realized that we, as the only Dutch team, at least shouldn't finish last, and that's when the event also for us had turned into a competition, although not as seriously as it had for some fellow event attendees. We had decided to take it a little slower as we also were there to enjoy the area. Twelve new caches had been placed in Alsace and had became active that day especially for the event, and points could be earned by visiting them. How many points depended on difficulty and terrain, and extra points were given to those being the first to find the cache. 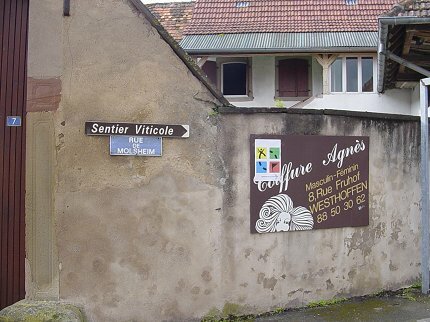 We first decided to do the cache AlsaCache 2005 #4 Bugatti Town (GCMW1Y), a nice multi in the village of Molsheim. We arrived second at the cache and the golden ticket for the first visitor had already been taken, and thus we unfortunately just missed out on some extra points. The second and third cache we did were AlsaCache 2005 #1 Cascade de Nideck (GCN56E) and AlsaCache 2005 #6 Forêt de Westhoffen (GCN7N5). We tried for a fourth cache, but were running out of time because we had to be back in Traenheim by 18:30. We had lost some time by going down the entire way to the bottom of the gorge at the Cascade de Nideck cache. This wasn't necessary to find the cache, but we didn't want to miss the beautiful waterfall. Looking at the cache descriptions and hearing about them from other event attendees, I wish we could have done the remaining 9 event caches as well! All 12 event caches have become permanent ones though, so maybe we should return to the area again someday soon. 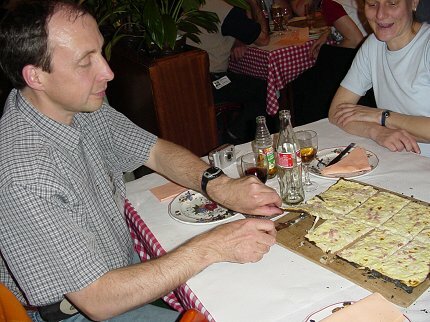 The event was concluded with a dinner at restaurant Lauth serving the local specialty tarte flambée in the picturesque village of Scharrachbergheim. In the competetion we had managed to obtain the 9th place (from the bottom, with about 35 teams participating :-) Very unexpectedly we also were among those who were awarded a prize at the event dinner. Ours was for the "Furthest journey (without most TBs)" (402 kilometers crow's flight from my home coordinates to the event). 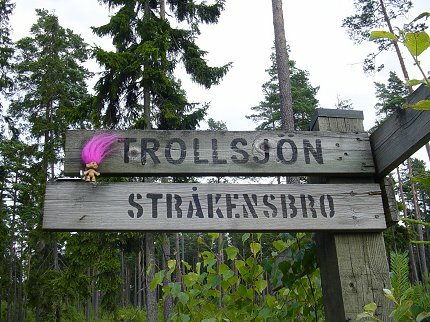 Actually, TravelingViking had made a slightly longer journey but he was awarded the prize for "Most TBs". At the end of the day sTeamTraen could look back at a wonderful, succesful en very professionally organized first-ever geocache event in Alsace! We can't wait til the next one! During the event we met a lot of friendly fellow geocachers, including Team MatUsi, our camp site neighbours with the VW Beetle who also turned out to be geocachers, and TravelingViking, also from Germany. TravelingViking a.k.a. The Travel Bug Mover has helped travel bugs traveling for a total of more than a million kilometers! He had brought 40+ travel bugs to the event! And that brings me to the amazing story of Hula Cat (TBHK2Y). Travel bug Hula Cat started out on his journey at my international exchange cache Dutch Treat (GCMXEK) in Alaska. It was placed in there by its owner RLTW, the cacher who "FTF'ed" Dutch Treat. The bug's goal was set to The Golden Heart of Alaska (GCNQY0), the exchange project sister cache in the Netherlands. Prior to the event I received an e-mail from RLTW who told me that Hula Cat was already in France and asked me if I could keep an eye out for him. RLTW didn't know I was going to the AlsaCache event. I immediately checked the TB page to see if maybe Hula Cat was close to the event. I don't have to tell how surprised I was to see that Hula Cat was actually placed in "AlsaCache2005"!!! I immediately contacted TravelingViking, the cacher who placed the TB in the event, and asked if we could arrange a TB swap at the event dinner. Well, I did get Hula Cat from TravelingViking, and on a recent maintenance trip to the Golden Heart of Alaska cache I placed it in there. After only 10 moves Hula Cat had managed to reach its goal! It's a small world! We regularly like to make a geocaching day trip to the Eifel region of Germany (see "Ardennes, Eifel & Luxembourg"). But the day trips are always too short, and the beautiful, geocache rich area just invited for a longer stay. So, for the period 5-12 March 2005 we booked a small vacation cabin at the Schnee-Eifel Feriendorf, the "home base" for a week-long geocaching tour in the Eifel, the Mosel, and some neighbouring regions and countries. In March, an Eifel basking in early spring weather would await us, we thought. The contrary was true! A week before we left, winter was still holding the area in a firm grip. At night temperatures still dropped to minus 20º C, and in the Hohes Venn area and in the neighbouring Belgian Ardennes snow depths of up to one meter were reported! Don't get me wrong, I do love snow and winter weather, but with so much snow would it still be possible to find a geocache? A Norwegian friend living north of the Arctic Circle once said to me: "Life's so much easier when the snow has melted. Snow makes everything in life more difficult". This also holds true for geocaching. A layer of snow makes many a cache the proverbial needle in a haystack. The snow sure didn't promise much good for our upcoming geocaching tour to the Eifel. In the end we had little problems finding the caches on our to-do list. There was snow, on the ground, sometimes a thick layer of it, and falling, sometimes a lot of it! But luckily at many of the cache locations there was only a thin layer or none at all. And at the cache sites that were heavily snowed over, luckily a good hint or spoiler photo was provided. It's in situations like this that you really learn to appreciate the good additional hint! And your folding army shovel! And what a feeling of victory when you finally manage to find that cache hidden under a deep layer of snow! We visited a total of nine caches: seven in Germany, one in Luxembourg, and one in Belgium. The highlights include: Medieval View (GC26C), GeoWolf8: A Visit to Vianden (GCJGQF), Der Wallende Born (GCGZ53), Weinheim Trift Earthcache (GCM4KK), Kirche ohne Dorf (GCMF6Y), and Dornröschen (GCK77F). 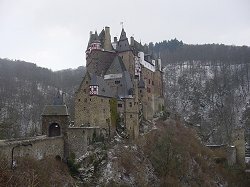 Medieval View (Germany) is one of the oldest caches in Germany and brings you to the site of the spectacular Eltz Castle, without doubt one of the most beautiful castles in Germany. GeoWolf8: A Visit to Vianden (Luxembourg) brings you to scenic medieval town of Vianden and up into the hills above it, a tough climb which is rewarded with some breathtaking views over the town and its lake. Der Wallende Born (Germany) brings you to the little village of Wallenborn and its unique cold water geyser. We'd already discovered this geyser a couple of years ago while doing another cache in the neighbourhood and this cache hadn't been placed yet (see "Ardennes, Eifel & Luxembourg"). It was good to be back here. A visit to the local bee-keeper is recommended. They sell some delicious Eifel-honey! The Weinheim Trift Earthcache (Germany) was a new first in geocaching for us; our first Earthcache! An Earthcache is a special type of virtual (with its own special gc.com icon designated to it) which enables the visitor to view a special geo-science feature. The Weinheim Trift Earthcache shows part of the sea bottom as it existed 30 million years ago on what is now dry land. The "trift" contains many interesting fossils. Kirche ohne Dorf (Germany) was an interesting one. It brings you to the former village of Eckweiler. This little village disappeared from the map in the late 1970s/early 1980s when its inhabitants left due to the expansion of a nearby airbase and the aircraft noises that came along with it. Ironically, in 1997 the airbase was closed. Now the only thing left of the village of Eckweiler is the church and the graveyard. Once a year the former inhabitants of the village come together at the Eckweiler church. A special place where a certain sadness can be felt, a feeling which is only strengthened by the memorial plaque on one of the walls of the church beginning with the text "Unsere alte Heimat". Dornröschen (Germany) was really wonderful. It brings you to the picturesque village of Beilstein on the Mosel River. The village is also called the "Sleeping Beauty of the Mosel". The multi ends high in the hills near the Beilstein castle looking out over the village and the beautiful Mosel valley with its countless vinyards, which on the day we were there were bathing in sunshine. This for a change from the grey and snowy skies we had seen throughout the rest of our tour. Back home we missed the snow and we were soon longing again for the adventures of a week of winter caching! I've always been fascinated by European dwarf countries like Andorra, San Marino and Liechtenstein, especially Liechtenstein, the little principality hidden deep in the mountains of the Alps. 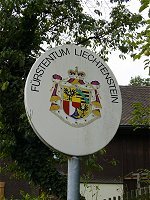 One day, just out of curiousity, I checked the country listing on gc.com to see if Liechtenstein was included. It was, and I was surprised to find out that the little obscure country actually had three caches lying within its borders! Ever since, I kept hearing the irresistible calling of these caches. So in the late summer of 2004 I planned a geocaching tour to include a daytrip to Liechtenstein. 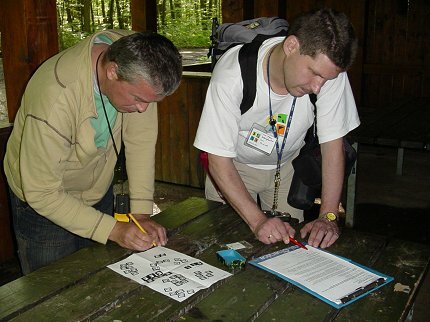 The tour from September 25 to October 2, 2004 would further include some geocaching in Austria and Germany's Bavaria area. It became a beautiful and memorable tour with lots of great geocaching highlights. 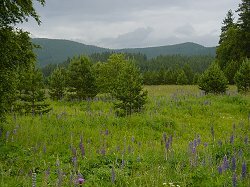 What I think will especially stay a lively memory of this tour are the sounds of cow and sheep bells coming from the mountain meadows, accompanying us almost everywhere while geocaching, providing for a very special atmosphere. I made this recording with my pocket PC at the site of the 20 CNTS CACHE OF LIECHTENSTEIN (GCGCT9). Listen to it and imagine yourself hiking and geocaching in an alpine landscape! During the tour we visited ten caches: one in Austria, two in Liechtenstein, and seven in Germany. The highlights include Pirate's Eibsee Cache (GCGQG1), Hackl Bobs Doping-Box (GCJGPX), the Oberstdorf Geocache (GCHF2E), Hobbitland (GCJ5WJ), and of course the two caches in Liechtenstein. Pirate's Eibsee Cache (Germany) brings you to the gorgeous Eibsee lake at the foot of Germany's highest mountain, the Zugspitze (2962 meters). The lake's made up of the most beautiful green colors we've ever seen. Hackl Bobs Doping-Box (Germany) is a really interesting "lost place" cache. It brings you to the old bob sledding site of the 1936 Winter Olympics, a "secret" place in the mountains above the lovely town of Garmisch-Partenkirchen. The remains of the site are still there, including an old "Olympia Bobbahn" hut and the bob track lift facility. The Oberstdorf Geocache (Germany) leads you through the beautiful rustic wintersports village of Oberstdorf. The last part of the tour before reaching the cache takes you into the mountains along the spectacularly green Trettach river. A beautiful sight with the yellow and red leafed trees of autumn! Hobbitland (Germany) was a really special one. This multi cache leads you through a magical fairy tale landscape reminding of one out of a Tolkien story (hence the name Hobbitland). Strangely the area was abundant with blooming crocusses. We thought these are supposed to bloom in springtime? Suddenly out of the blue along the trail that is used so little that one can hardly recognize it as being a trail you'll encounter a lonely little chapel. On a hill nearby stands a cross with a statue of Jesus. It all adds to the extraordinary feeling you get from this landscape. I know of no other place that compares to it. This is a must-do cache! And then there were of course 20 CNTS CACHE OF LIECHTENSTEIN (GCGCT9) and Liechtenstein's First ((GCC2F4). These, beside being located in a spectacular mountainous setting, being highlights alone for being in the obscure country of Liechtenstein!! The 20 CNTS cache is located not far from the border with Austria and was soon reached after entering the country. 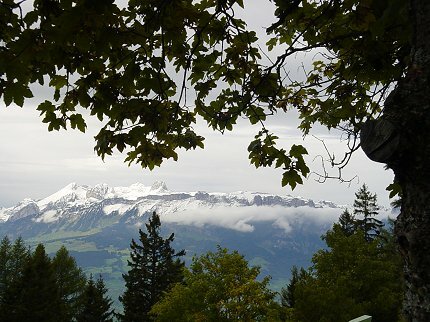 Liechtenstein's First is located a little further into the country at Gaflei (see view from Gaflei, photo above) in the mountains above the country's capital Vaduz (doesn't even the capital's name sound mysterious and interesting?) at a height of 1500 meters. It seemed as if the narrow and steep winding road to Gaflei never came to an end. The road further up from the Liechtenstein Castle at one point became extremely narrow, and I was relieved to find out that this part was one-way only. Well, as somebody put it in his gc.com log for this cache: a challenge for every driver! The beautiful border-post stamp from the Liechtenstein village of Schaanwald that was placed on one of the pages of my personal geocaching logbook when we had just entered the country will always remind me of this very special geocaching experience in one of the smallest countries of the world. On July 13th, 2004 we took a trip over to Sankt Augustin near Bonn in Germany, a 4 hour drive from our home in the Netherlands. Our goal was Naturschauspiel (GC5E31). This cache is hidden in an area with a large fire fly population. The cache is only active during the "fire fly season", starting around late June / early July and lasting only three to four weeks. During this period the fire flies are active (i.e. emit light) for about half an hour each night, just before the last daylight has disappeared and it gets completely dark. The purpose of the Naturschauspiel cache is to bring you to the right place at the right time and thus to witness a fire fly show. Fire flies aren't very common in our part of the world, and never before we had seen one of these amazing creatures. I didn't even know they existed in Europe, and always associated them with far away tropical places. Well, all that changed with our visit of the Naturschauspiel cache. What a beautiful experience to see all those fire flies in the dark forest, reminding us of little dancing stars and elfs with little lanterns. We felt as if we were part of a beautiful fairy tale. Amazing! How easy it would have been to miss this wonder of nature if it wasn't for this cache! The cache has its own "Naturschauspiel" CD-ROM of which you can take one when you visit the cache. It's packed with information and items related to fire flies. Without doubt one of the most beautiful caches we've ever done! Team JC occasionally produces a CD-ROM called "The First Geocache", and leaves it in random caches as a signature trade item. The CD-ROM includes the "Dave Ulmer Original Cache Videos". 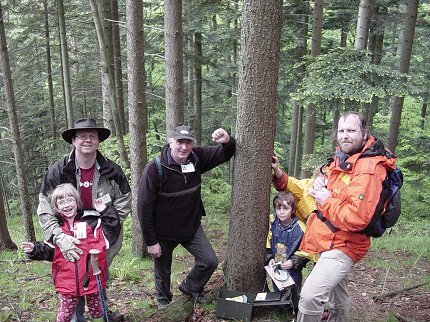 On May 3, 2000 at N 45º 17.460' W 122º 24.800' in the US state of Oregon, Dave Ulmer placed the world's first geocache. One day later it was found for the first time. Since that time, the sport of geocaching has grown tremendously, with tens of thousands of geocaches hidden all over the world, and equally as many players. In the summer of 2003, on behalf of all geocachers an "Original Stash Tribute Plaque" was placed at the original first geocache site, recognizing the importance of the event that happened here, an event that eventually led to the birth of modern-day geocaching! The CD-ROM includes two Dave Ulmer videos. The first video was made as he prepared the first geocache. The second video was filmed at the plaque dedication in the summer of 2003. Both videos are just one minute in duration. The CD-ROM also includes a short history of geocaching in html format and a picture of the First Geocache plaque. All material was collected from the Internet. The CD-ROM currently left in caches is the 1st edition. A second edition is planned for the near future. Here are some of the trade items we found in caches. 1. Tiny matchbox taken from Cave of Dorneck (GCGDY3), Switzerland. The matchbox is from Swiss watch maker Oris. 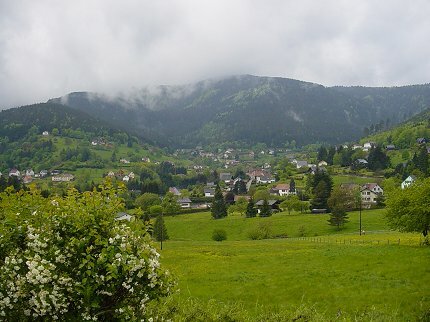 From May 15 to May 22, 2004 we did a geocaching tour in the lovely Vosges Mountains area of eastern France with a daytrip into neighbouring Switzerland. We found 8 caches in France and 3 in Switzerland. Switzerland was beautiful and in our enthousiasm we did too many caches and ventured too far into the country. As a result it got very late at night (or better, early in the morning the next day) before we finally got back to our vacation address in France. On the way back on the dark Vosges mountain roads we got caught in terrible thunderstorms and conditions with bad visibility due to steam forming when the rain cooled down the sunbaked roads. In Switzerland, La Combe (GCGP97) was the absolute highlight. 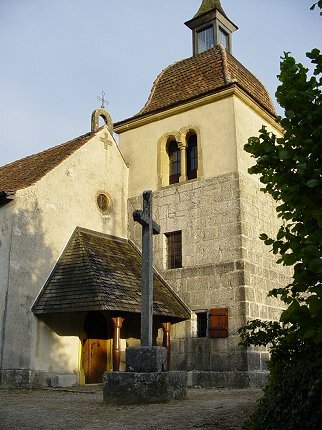 This small hamlet with its beautiful old chapel (see photo) is reached after taking a small mountain road which dead-ends in the hamlet. The evening we were there the warm air was filled with the sounds of crickets and the almost musical metallic cacophony of cowbells coming from the mountain meadows. How peaceful one gets in this place. I guess Himalayan monks would have no problems adjusting here. Our tour through beautiful and lovely Vosges saw many geocache highlights though, including Tendon Waterfalls (GCC5BD) for its beautiful waterfall and for being our first French cache, Grand Ventron (GCGJVK) with the beautiful car ride up there alone being worth the trip, and of course climbing to the top of the 1424 meter high mountain Grand Ballon to get to the cache with the same name (GC87B0). On the way back to Holland we also visited Das Geisterdorf (GCG8RT), a French ghost town not far from the German border. This controversial cache had been on my to-do list for some time. Creepy but fascinating! More photos in the "Caches Found" section. 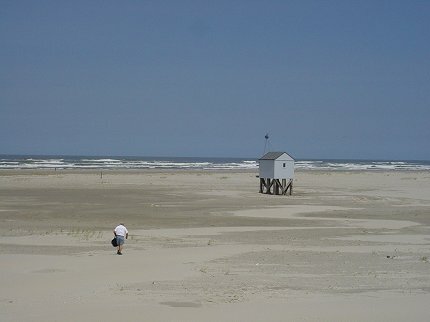 In the period June 25-28, 2004 we did a long-weekend geocache tour on the island of Terschelling, one of the Dutch "Wadden" Islands. We found 4 caches. The virtual cache Huske op e Slenk (GCG2H2), an old restored shelter for shipwrecked people on the eastern part of the island was one of the highlights. It's located on a remote beach, approximately 7 kilometers from the nearest inhabited point. Other Wadden Islands we've geocached on so far are Ameland, Texel and the German Wadden Island of Borkum, one of the "Ostfriesische Inseln". More photos in the Caches Found section. If you didn't know about them yet, it might be worth checking out some of the geocaching e-zines, periodically published geocaching magazines which can be read online or can be downloaded as a PDF file. One e-zine we particularly enjoy is Today's Cacher. Also Geocaching i Sverige is one we like to read. Unfortunately it's in Swedish only. In an earlier piece I wrote about geocaching e-zines on this page, I expressed my wish for a paper geocaching magazine. Well I'm happy to report that my wish has come true. In June 2005 the first paper version of Today's Cacher will be mailed out to subscribers. For starters it will be published quarterly only, but they hope to be able to make it a monthly publication in the future. Of course I was one of the first to subscribe. Nothing beats sitting on the couch on a rainy day and reading a paper mag about your hobby. Better than staring at a computer screen. Update February 14th, 2010: I received only two hard-copy issues of Todays Cacher, and a t-shirt for becoming a member. After that, never heard from them again. It also seems their website is not updated anymore. I'm not sure if Geocaching i Sverige still exists or if an archive is available. The above link now gets you to the www.geocaching.se site. Good news: since this year a new bimonthly hard-copy geocaching magazine called FTF Geocacher is published. Of course I subscribed, and I sure do hope this magazine will be more succesful than Today's Cacher. 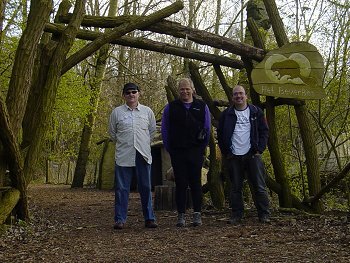 For those who speak Dutch a great geocaching e-zine called Spoiler can be found at www.geozine.nl. 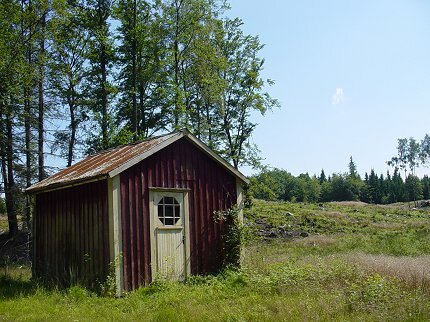 The Cottage cache is hidden near an old cottage that used to be part of a lively farm deep in the Swedish forest. The cottage isn't closed and can be entered and visited. All the old furniture is still there. The cottage was lived in until 1930. If it isn't for the special atmosphere of this place, it will be for the thousands of blood sucking, who-cares-about-DEET insects that this cache will stay a lively memory. The Hunters Hut cache is hidden inside a, you guessed it, hunters hut (see photo above). I remember knocking before entering the hut and preparing to have a close encounter with a trigger-happy Swedish redneck :-) On the inside walls of the hut all kinds of game animals are painted, some of them centered by the painted concentric circles of a gun sight. Röda Näckrosor is hidden in a magnificent natural area with beautiful lakes filled with water lillies. This area is unique in that it's the only place in Sweden where red water lillies can be found. Between all the white ones, we actually managed to spot a couple of them! Gamla Varberg was great for the wonderful view over the Kattegat sea. And for the nice seabreeze on a very hot day. With over a couple of thousand caches, many of them hidden at interesting places or in a beautiful natural setting, Sweden truly is a geocacher's paradise. More photos in the Caches Found section. Every now and then we get in a crazy mood and make a geocaching daytrip into the Ardennes region of Belgium, the Eifel region of Germany, or Luxembourg. A crazy mood because most Dutch people would find these places too far for a daytrip. Some of the most beautiful caches we've done in these regions are those of Captain Cook. Especially La vallée (GC8342) is one we have beautiful memories of, a cache trip along the small river Hoegne in the Ardennes. During the morning drive fog had prevented us seeing any of the landscape, but by the time we arrived in the Hoegne River area the sun had broken through. It was still a little misty, and this provided for a special light and atmosphere. The cold Ardennes autumn air felt clean and crisp. To reach the parking area we had to wade through the stream of the Hoegne River with our car. No bridge here, the small road just continues its way through the river. A really cool experience, I must say! When there's much water in the river, it's not always possible to cross it, according to some cache logs. Then we started our hike up the Hoegne River valley. The little wooden bridges over the river, some of them not more than a tree log with a railing to hold on to, were shrouded in a haze of mist coming from the damp wood warming up in the diffuse sunlight. The river cascades down the beautiful sunlit rocky valley, everything of such intense colors and freshness. 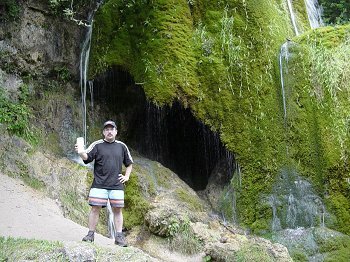 In one of the logs on gc.com, a geocacher wrote: "This is the most beautiful place on earth". I'm not sure if it is, but there's definitely no other place more beautiful that I know of within a three hour drive from our home. 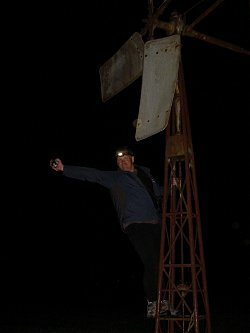 Photos in the Caches Found section. 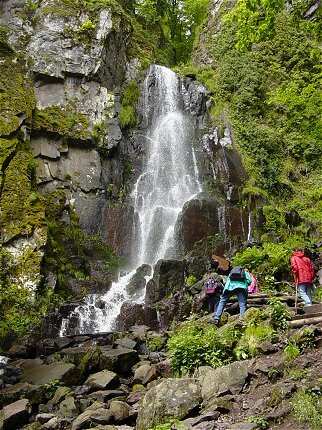 One of the most beautiful caches we did in the Eifel area was Growing Falls (GC5FF9) with its beautiful waterfall. I don't know how to subscribe the special beauty of this place, but after a small, rocky path through the forest we arrived at a place that reminded me of a hidden place Indiana Jones could have discovered. Best is to take a look at the photo above, although even photos won't do justice to this magical place. Another one we enjoyed was Windsborn Crater Lake (GCG1WT), as we really liked how it let us discover the unique cold water geyser at N 50º 09.239' E 006º 43.219' in the nearby village of Wallenborn. Photos in the Caches Found section. The most beautiful cache we've done in Luxembourg is Rock Labyrinths (GC5F71). With its magnificent sandstone rock formations, this must be one of the most spectacular natural places in Europe. This is a must-do cache! Take a look at the photos in the "Caches Found" section! Elfsteden-tocht, March 8/11 2002 - A memorable multi-cache tour following the route of the famous Elfsteden (Eleven-towns) ice skating marathon connecting 11 towns in the Dutch province of Friesland. Unfortunately the cache soon proved to be impossible to properly maintain and was closed. Instead of doing the tour on ice skates, the geocache-version had to be done mainly by car with some parts on foot. Just like in the real marathon, checkpoints had to be visited. The checkpoint in every town consisted of a waypoint with a hidden rubber stamp and the coordinates of the next waypoint. At the 2nd waypoint a card had to be obtained which could be stamped with the checkpoint stamps. The waypoints brought us to famous Elfsteden-tocht sites, like Bartlehiem and the "It Sil Heve" bridge over the Murk river, tiled with thousands of little blue tiles, each one of them holding a portrait of an Elfsteden-tocht finisher. After completing the tour the card could be send-in and you would then receive a special geocache-version of a cross almost similar to the much coveted ones Elfsteden-tocht skaters get when finishing with a fully stamped card. Unfortunately ours was stolen in the mail. The envelope was slit open and only contained our stamps-card and a certificate. The imprint of the cross could still be seen in the envelope. Due to the lack of cold during the past winters, the last real Elfsteden-tocht was held in 1997. 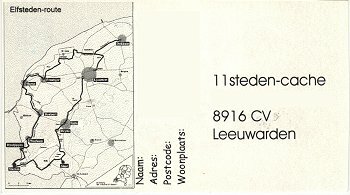 More info on the real Elfsteden-tocht marathon at www.elfstedentocht.nl. Who doesn't like the surprise of opening a cache and finding one of those familiar shiny dog tags in it, attached to the most unusual and funniest trinkets? "Where does it come from?" is always the first question that comes to my mind, and I'm always eager to get home and enter the tracking number on gc.com to find out. The first travel bug I ever saw was Cache Cart 8 (TB536). In May of 2002 geocachers visiting over from the US left it in my cache Loonse & Drunense Duinen a.k.a. Dutch Sahara (GC1B73). I immediately went over there to retrieve it. This must have been one of the first travel bugs in the Netherlands! We eventually let it go again in Germany at the Rapunzel Cache (GC9686). From there it actually managed to get to the Republic of South Africa. Unfortunately it got lost there when the cache it was in was stolen. Since that first bug, many more were retrieved, all kinds of them, and some of them of course being more special to us than others. One that's very special to us is adorable Chilly DeMoose (TB6360) from the US. This TB wanted to go to moose country, so I jokingly said that I'd bring it to Sweden. And that is what we eventually did! Another special travel bug friend of ours is Moe Definitely (TB458D), a cool Three Stooges puppet, also from the US. We found him in the cache Linaigrette (GCA10B) in France. We had unsuccesfully been searching for this cache for some time when suddenly local geocacher sTeamTraen from Traenheim arrived at the cache location. The cache had not been visited for about half a year, and now it got two visits on one day, at the same time! What are the odds, knowing that geocachers are a rare breed in this part of the world? I anxiously went on with the search, as I was hoping that Moe was still in there and I didn't want sTeamTraen to get him. Yours truly was the one who eventually found the cache, so Moe went home with us to the Netherlands. When I took Moe out of the cache in its ziploc bag and placed it in the sunlight, immediately condensation started forming inside the bag. We were joking that after being locked up inside the small cache for almost 6 months Moe apparently was still alive. And then there is of course our own travel bug Cheechako (TB1A7E). Being big Alaska fans we set this northern US state as the bug's goal. We never could have thought it would actually reach it someday. But it did! After 616 days and 12,051 miles Cheechako arrived in Alaska and was placed in the cache Taiya's Playground (GCGRXF). On his journey he visited 22 caches, 5 countries and 6 US states, and traveled with 21 different geocachers. 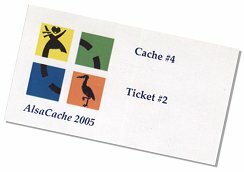 We released Cheechako in June 2002, and it must have been one of the first Dutch travel bugs. At the time, the official travel bug tags weren't available in the Netherlands yet, and we had to order ours in the UK. One of the first caches outside the Netherlands Cheechako payed a visit was La vallée (GC8342), and this is actually how we found out about this beautiful place (see "Ardennes, Eifel and Luxembourg"). Since a couple of months I'm actually having the honour of a bug from the US having its current goal set to travel to my cache Kokopelli (GCE956) and meeting me. It's Kiss, the Frog 1 (TBDCDE) from the state of Washington, one of the travel bugs of geocacher ohjoy! It's already in the Netherlands and I hope to be able to meet this travel bug soon. We'd really like to hear from fellow geocachers visiting our website. Please sign our guestbook and say hi!